TFW you learn something that saves you a ton of time. Our GitHub services team has on-demand content for learning Git, including a Git out of Trouble section. On page 2 git-set-up they show you how to create a script to create several files, commit them to your repo, one file at a time. 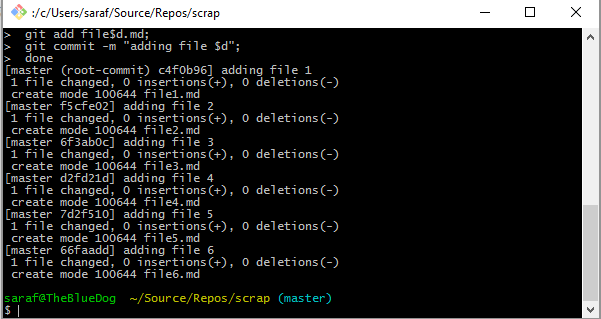 First, you’ll want to do `git init` otherwise, you’ll get yelled at by your shell for not being in a git repository. and enjoy your Git out of Trouble explorations!